Not surprisingly, Deer Cave is home to many species of bats. Between 5 and 7pm, if the weather is fine, visitors may be treated to the spectacular sight of a black cloud of free-tailed bats emerging from the entrance of the cave to go in search of food. This video is just one of the short clips taken by my son whom visited the Mulu Caves with my wife in July, 2005. 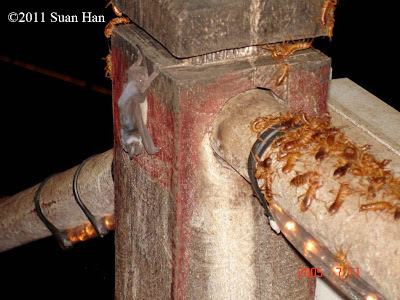 They also took this photo of the baby bat hanging on the post with the insects. These insects eat the bats dropping hence is also called the cave janitors.